Texas teachers and all other teachers that might like to make a trip to the Alamo city . . . 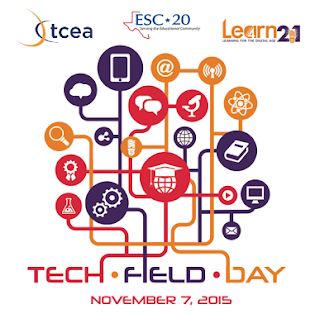 I am super excited to share with you the FIRST TCEA Area 20 Tech Field Day! There is NO FEE for this event! So that makes it FREE! Who doesn't love free? Teachers, administrators, tech directors, library media specialists, tech support staff and anyone who is interested in finding out more about the integration of technology in education. Registration is now open! Join us! Sounds interesting. Please keep us posted on sessions and more details as they become available. Thank you so much for the amazing session you hosted. I learned so much from attending. Is there any way I can get a copy of the presentation? I'd truly appreciate it!! I looked on the resources section but it still wasn't up. Thanks again! !